Digital Measures is a product used for faculty activity reporting. As of Fall 2013, the Office of Institutional Research has taken on the management of data and changes to Digital Measures reports and screens. Below you will find resources to help understand how to enter data and best practices regarding inputting information. Guides are provided here for a wide range of topics, from a basic overview to detailed guides specific to each college. If you are interested in Digital Measures training, then please fill out the Digital Measures training interest form. If you fill out this form, we will let you know when the next training is available or contact you about an individual training session. If you have any questions or your Digital Measures University Administrator is Amber Hall, Director of Institutional Research, and can be contacted at amberh@uca.edu or 501-450-3663. You may also contact the Research Associate assigned to your college/unit by looking at the table below. Faculty can access Digital Measures from the myUCA portal. 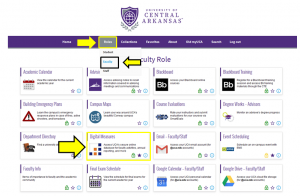 After logging in to myUCA, which is the password faculty use to login to their office computer, e-mail, and several other systems on campus, navigate to the Roles tab, select the Faculty option. You should see a Digital Measures icon as shown below. After clicking, you will be logged into Digital Measures in a new browser tab. All guides can be found on the Digital Measures Guides page. If your education is listed incorrectly or not in your Digital Measures records, go to the Digital Measures Education Screen page to submit an update. A field has been added to Publications to add in a supporting document/file and give a description of the file. This description field will pull into the mid-tenure review application. A field has been added to Presentations to add in a supporting document/file OR a web address and give a description of the file/web address. This description field will pull into the mid-tenure review application. A field has been added to Grants and Contracts to add in a supporting document/file and give a description of the file. This description field will pull into the mid-tenure review application. A field has been added to the below screens to add in a supporting document/file OR a web address and give a description of the file/web address. This description field will pull into the mid-tenure review application. Artistic and Professional Performances and Exhibits Applicable only to CFAC faculty. A field has been added to the below screens to add in a supporting document/file and give a description of the file. This description field will pull into the mid-tenure review application. Intellectual Property Applicable only to CNSM faculty. A field has been added to Curriculum Development to add in a supporting document/file and give a description of the file. This description field will pull into the mid-tenure review application. Teaching evaluation summaries for each course can now be stored on scheduled teaching. The new user interface has been implemented with Digital Measures. The updated guides will start with version 2.0. OIR has uploaded all degree information that they had databases on. If you data is still not complete in the Education screen, please fill out the form here. OIR will be working on continually updating the Education screen. We have modified the Non-Credit Instruction Taught screen to allow faculty to store files, such as movies, PDFs, or any other such materials to highlight their work. We have moved the following screens to the Faculty Annual Self-Evaluation and Planning Reports section of Digital Measures. Annual Librarianship/Information Management Goals Applicable only to Torreyson Library faculty. We are working on phasing out the Work in Progress screen. Information previously stored on this screen will now move to the Artistic and Professional Performances and Exhibits (Applicable only to CFAC and Honors College faculty. ), Presentations, Publications, or Grants & Contracts with the status of “Work in Progress.” When you move data to the other screens, there are new fields “Date Project Started” and “Date Project Ended” to reflect the beginning and end dates of your work, without respect to submission. The Summary of Librarianship/Information Management Activities screen has been renamed to Summary of Other Librarianship/Information Management Activities. Applicable only to Torreyson Library faculty. We are working on phasing out the Other Activities and Accomplishments screen. Anything stored on this screen should be moved to the appropriate screen for recording the information or should be stored in the Other Instructional, Scholarship, Professional Development, and Service – Not Reported Elsewhere screen. Added clarifying field to Education screen, Highest degree you have earned? for College of Business and Qualifying Degree? for all others. If “Yes” is selected for this field, the degree shown on the screen will be populated on the Faculty Annual Self-Evaluation and Planning Report. The Consulting screen has been made available to the entire university and moved under the Service section. The options of “Consultant” have been removed from the Public screen and Professional screen. The data from those two screens have been migrated over to the Consulting screen. The screen Other Activities and Accomplishments has been moved from under the General Information section to the Faculty Annual Self-Evaluation and Planning Reports section. The screen Education has been made available to the entire university. OIR is currently working on uploading any degrees we have on record in Banner and modifying the screen. Further updates will be given on this screen as modifications are made and data imports are completed. The screen Permanent Data has been modified to now include all ranks held while at UCA. OIR is currently working on updating this information. If your information is missing and you would like to check the status of your information, feel free to e-mail OIR. Further updates will be given on this screen as modifications are made and data imports are completed. Courses Beyond Last Degree can now be tracked on the Faculty Development Activities Attended screen. This is was setup in the hopes that we will be able to generate the application for Tenure & Promotion and Advancement using Digital Measures. The screen Academic, Government, Military and Professional Positions – External to UCA has been made accessible to all faculty. This screen is to be used to capture positions external to UCA, specifically positions/ranks held at other institutions that should show up on promotion and tenure. All data from the four above screens have been migrated to the new screen.